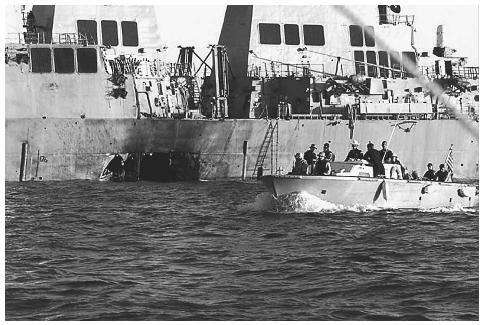 On the morning of October 12, 2000, as the Navy destroyer USS Cole sat anchored in the Yemeni port of Aden, a small boat packed with explosives rammed into its side, tearing a 40-foot hole through the ship's outer hull, killing seventeen sailors and wounding thirty-nine more. It was the deadliest attack against the United States military since 1996, when a truck bomb exploded near an apartment complex in Dhahran, Saudi Arabia, killing 19 American servicemen. A ship in hostile waters. The Cole, one of the Arleigh Burke class of guided missile destroyers, was based in Norfolk, Virginia. The ship was on its way from the Red Sea to the Persian Gulf to help enforce United Nations sanctions against Iraq, when it made a routine stop in the Yemeni port of Aden for refueling. American intelligence officials had long been aware that Yemen was home to a number of Islamist fundamentalist groups. In the weeks before the attack, the country was home to violent demonstrations against the treatment of Palestinians in the Israeli-Palestinian conflict and America's supposed pro-Israeli stance. Although Cole Commander Kirk Lippold had been told of no specific threat against his ship, it was on what is known as "Threat Condition Bravo"—the second highest of four threat levels. At alerts of that level, the ship's guards were required to be on the lookout for small boats. No flags were apparently raised when a small fiber-glass boat approached the Cole. Eyewitnesses said the boat was helping the big destroyer with its mooring, when it pulled back to the Cole's port side. The two men on board reportedly stood at attention before their boat exploded, blowing a massive hole in the destroyer's steel hull. Damage to the $1 billion warship was estimated at $250 million. Within hours of the explosion, Pentagon officials said they had reason to suspect a terrorist attack. FBI and CIA agents, as well as the Pentagon's Fleet Anti-Terrorist Support Team, were quickly sent to the scene to investigate. Within weeks, officials announced that they believed the blast to be the work of Osama bin Laden, the Saudi Arabian exile whose al-Qaeda terrorist network was also connected to the 1998 bombings of two American embassies in Kenya and the 1993 World Trade Center bombing. Al-Qaeda would later be linked to the September 11, 2001 attacks on the World Trade Center and Pentagon. explosives. And just two weeks before the attack, the Arab news channel Al Jazeera broadcast a video of bin Laden in which he made threats against the United States. A troubled investigation. Although American intelligence officials moved quickly after the USS Cole attack, the investigation hit a number of snags. Yemeni officials questioned more than 1,500 people, yet they restricted American officials' access to key suspects. In June 2001, FBI agents were pulled out of Yemen because of credible evidence that there was a terrorist threat against them. The FBI and U.S. State Department disagreed over how to steer the investigation and deal with the uncooperative Yemeni government. The U.S. government still could not prove that al-Qaeda was behind the attack, and they were concerned that several key operatives remained at large, possibly planning more attacks against American interests. United States officials did make significant progress in their investigation, eventually capturing several key suspects in the attack. In October 2002, the FBI nabbed a senior al-Qaeda operative named Abd Al-Rahim al-Nashiri, who is suspected of masterminding the Cole attack, as well as plotting several other attacks against other U.S. and British warships. The following month, a CIA-launched missile killed Abu Ali (also known as Qaed Senyan), a man who was said to have played a major role in the Cole attack, as he was traveling with five other al-Qaeda members in Yemen. Hosenball, Mark, and Greg Vistica. "The Search for Clues: Did Officials Miss Hints of an Impending Attack?" Newsweek. November 6, 2000:45. Kaplan, David E., Chitra Ragavan, and Richard J. Newman, et al. "Terror's Grim Toll." U.S. News & World Report. October 30, 2000:32. MacLeod, Scott, Elaine Shannon, Mark Thompson, Edward Barnes, and William Dowell. "How Feuds and Culture Clashes Have Stymied the USS Cole Investigation." Time. Volume 158 (July 16, 2001): 38. Nordland, Rod, John Barry, Mark Hosenball, Debra Rosenberg, and Gregory Vistica. "A Sneak Attack: Death at Sea." Newsweek. October 23, 2000: 27. U.S. Department of State. "Attack on the USS Cole: IIP Archives." < http://usinfo.state.gov/topical/pol/terror/colearch.htm > (December 20, 2002).